Following their win on our Tuesday Top Five’ favorite bromances, we got some sad news involving the futures of Shawn Spencer and Burton Guster. The most shocking part about last nights episode of “Psych” wasn’t Gus quitting his job, or the death of the Blueberry, but rather the knowledge of the show’s future fans were forced to watch with. The hearts of Psych-O’s sank yesterday when the announcement was made of the series final episodes. The show’s Twitter posted the tweet with an embedded video message for the fans. The video holds a fond farewell from stars, James Roday and Dule Hill, announcing that upon the show’s return on February 26th, five more episodes will air until the conclusion of the series. It’s a sad and surprising announcement for fans, with the recent musical’s success and an average of 4.6 million viewers (Entertainment Weekly). However, in an article on the cancellation, Entertainment Weekly writer James Hibbert notes that it may not be the end. Chris McCumber, president of the USA network, chose his words carefully when saying, “I don’t believe we’ve seen the last of Shawn and Gus”. Here’s to hoping that is true, seeing has there have been many rumors of a possible TV movie to tie up loose ends. Sort of a “Firefly”/”Serenity” way out. It would be hard to conclude everything in a mere five episodes, and with an unexpected cancellation there’s a very little chance that it will end the way it would if they had known its demise. So while Juliette has just recently discovered Shawn’s secret, it begs the question: will anyone else? 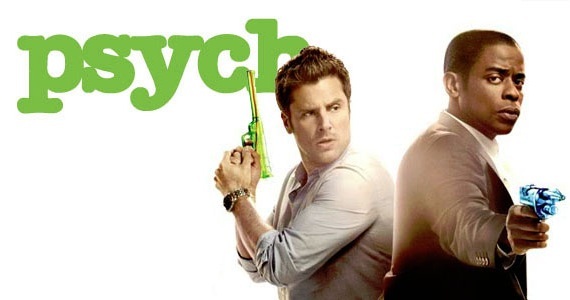 “Psych” has been running for eight years, and in 2013 celebrated 100 episodes; an impressive resume for a series today. So while it is shocking news to fans, it has definitely been a TV show to remember. The characters of Shawn and Gus will live long in our memories, and in the end that’s all we can ask for. What do you guys think? Maybe a possible movie in the future? Spin-off series even? What do you want to see? Thank you! I appreciate you looking it over 🙂 Sorry it took so long to respond!